My favorite boy toy and I recently celebrated our anniversary. It’s hard to believe we’ve known each other for forty years, let alone been married as long as we have. Our daughter surprised us with a set of new pots and pans. For some people (my Mom will laugh when she sees this because she knows who it is), a gift of kitchen stuff would not be welcomed. Not at all. For me though and for my boy toy, it’s a wonderful gift! I love proper cookware. If I had more time to cook, I’d cook everything from scratch. To me, cooking is a big ol’ message of ‘I LOVE YOU’. It’s not just about nutrition, it’s about providing for your family, of taking time and effort, and of spending time together eating a meal. Carol Flinders, in the popular vegetarian cookbook, Laurel’s Kitchen, wrote an introduction about how she gradually converted to a vegetarian lifestyle and began living green. She reminded us of the importance of the kitchen, of homemaking, of relaxing into the task at hand as we provided for our families. Her wisdom was shared in a cookbook written forty years ago, before any of this was popular. These writings, in each cookbook that she co-authored, influenced me profoundly. My daughter and I brown bagged lunches each day with homemade soups and breads, leftover casseroles made with legumes, grains, and vegetables, custards, and other goodies. My daughter eventually got tired of being different than everyone else, preferring PBJ or tuna salad. But even today, I take leftovers for lunch on most days (unless I’m trying out the food trucks during my lunch walk!). And all these years later, my daughter takes her lunch to work most days as well. Fixing and eating food is more than satisfying hunger. It is time together, an appreciation for the sharing of nourishment, and an opportunity to love each other several times a day. For me, having new cookware is a wonderful gift from a wonderful child. Thanks honey! Word for tomorrow – COMPANIONSHIP. If you prefer to work ahead, see the list for the week under “A Word A Day”. Happy anniversary! I agree with your thoughts about cooking. I too would cook everything from scratch if I had the time, but now it seems like such a treat to do so. I usually do it when I’m entertaining for special guests. I hope you enjoy your new cookware! Thank you & thank you! I appreciate you stopping by. It’s scary how similar we are…married for 4 decades…great hubbies and daughters…love of writing…pets…old things…memories. Where we differ…by miles…is your affinity for…numbers…and technology. I do love my technology. My daughter was a junior in college before she finally outstripped what I knew for math & computers. That wasn’t too bad! Our similarities are why we enjoy each other’s blogs so much. You and I also hang around some of the same other blogs too, for the same reasons. I just bought my own cookware this year for my apartment. My first set ever! I LOVE my new pots and pans. My mom helped pick mine out. 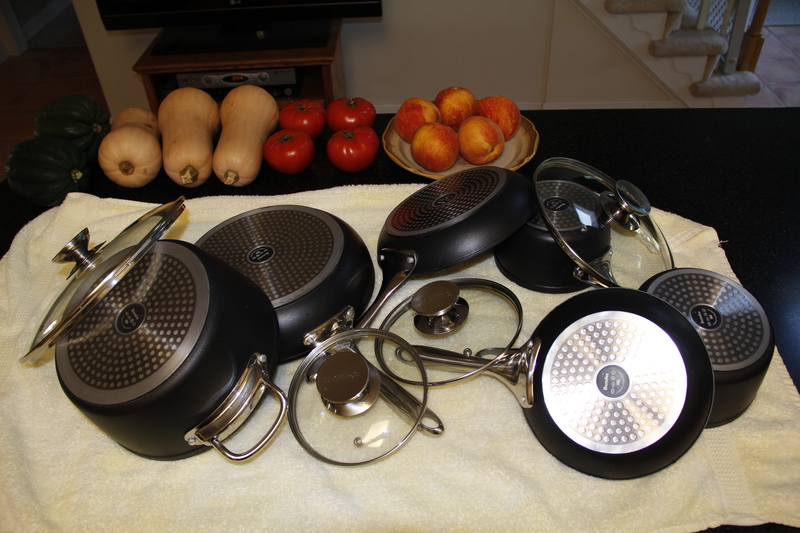 We got these gorgeous stainless steel pots with aluminum cores. They are so fantastic! I know you’ll enjoy your new pots as much as I do mine. Having good pots & pans makes a big difference. I’m glad you got a good set – I still have (and use) the set your great-grandmother gave me when I got married. It is amazing how live moves on and the years tick by. Congratulations to you both! The glass lids are great. It’s hard to believe we’re married so long. . . but then again, look at how long I’ve known you now! I have glass lids on a few of my pots and I really like being able to see what’s happening inside. And yes, I’m as easily amused as you are. That’s okay – I enjoy it! Geeks R Me.